The foundation stone of the Technion was laid in 1912, but the official opening was delayed due to WWI. 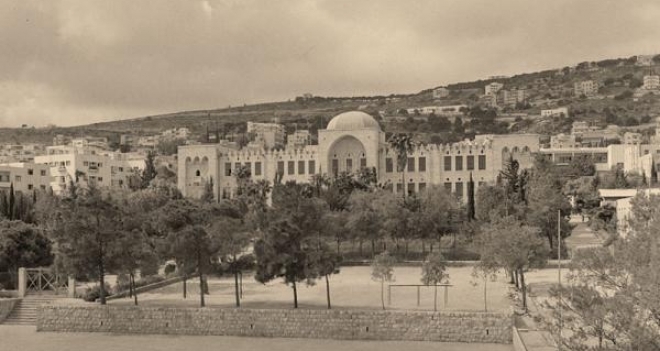 The Technion was officially opened with a Construction department in 1924. An Architecture department followed in 1925 and a Technology department with 3 specialties: Mechanical, Electrical and Chemical in 1935. The first Chemistry lab was opened in 1936. The Technology department spawned an Industrial Chemistry department in 1945, which became the fourth department at the Technion. In 1953 a Chemical Engineering section was formed in the Industrial Chemistry department, and became the forerunner of the current department of Chemical Engineering. In 1959 the department of Industrial Chemistry was temporarily merged with the newly formed department of Chemistry. When the two separated in 1962, the Industrial Chemistry staff (with one exception) was left in the Chemistry department, and instead of Industrial chemistry a department of Chemical engineering with two sections: Chemical Engineering and Food Technology was formed. In 1969 the department of Food Technology was spawned as an independent department. From 1943 to 1962 the department changed its name 10 times. The department moved in 1972 from its sprawling locations in the old Hadar campus to a large but unfinished building in the Technion City. In 1973, after receiving a gift from the Wolfson Foundation to enable finishing the construction of the major part of the building, the department got its current, and 12th name: The Wolfson Department of Chemical Engineering. A. The Industrial Chemistry period 1935-1948. B. Transition to Chemical Engineering 1950-1962. The syllabus in the fifties consisted of 200 credits with no electives. It included 45 credits in other engineering disciplines, 35 credits of Chemical technology and only 6 credits of Chemical Engineering. The purpose was to turn out Chemical technologists with good chemistry background and some knowledge of many engineering disciplines. The teaching was 100% frontal. Many lecturers dictated their notes to the students notes. The material was more qualitative than quantitative. The examinations required the students to learn by heart their notes. The saving grace were the many labs, which taught quantitative techniques. The first teacher of Chemical engineering and the founder of the modern Chemical engineering department and the head of the chemical engineering section, was William Resnick who immigrated to Israel from the US in 1948, worked for two years in the Defense Ministry Research labs, and joined the Technion in 1951. Jacob Geist who had been on the staff of the MIT, but was advised to, leave during the McCarthy period, joined the department in 1952 and Zeke Clark who came to Israel to help develop its minerals joined, part time in 1952. The addition of three chemical engineers enabled, for the first time, to teach thermodynamics, process control, engineering economy and to construct the first chemical engineering lab. Bill Resnick supervised the construction of the lab in 1953-5 by Mussa Bar-Ilan (Later to become the manager of the Refineries) and Ephraim Kehat, who were the only graduate students of chemical engineering at the time, and Joseph Mizrachi and Alex Himmelblau who were senior students at that time. Some of the experimental setups survived for over 20 years. The addition of chemical engineering credits required the reduction of chemical technology credits with considerable friction between the old school and the newcomers In .1955-6, the 5 members of the chemical engineering section left. Bill Resnick left to work in the US chemical industry, Jack Geist to start a new career at Air Products, Zeke Clark returned to the Bureau of Mines. Mussa Bar Ilan started his career at the Refineries and Ephraim Kehat left to study at the MIT. Some of the gap was filled by David Hasson who had just finished his studies at Imperial College and By Samuel Sideman who was recalled from his studies at Brooklyn Polytech. Joseph Gileadi was appointed as head of the Chemical Engineering section. David Ginsburg, the chairman of the department of chemistry and the vice president of the Technion was concerned for the future of the department. Hugo Heimann claimed that the future chemical engineer should be a chemical technologist in the European tradition and suggested to invite Prof. Waterman, the chairman of the department of Chemical Engineering at Delft to act as the arbitrator of the controversy. Professor Waterman came and to Hugo Heimanns dismay, but probably with some help from David Ginsburg, Professor Waterman recommended the American approach. It was obvious that new staff will have to be recruited and the old staff moth balled. David Ginsburg merged the Chemical Technology department with the Chemistry department, recruited William Resnick as full Professor to head of a new Department of Chemical Engineering and together with Bill Resnick they recruited a group of Technion graduates who were studying for the doctorate in the US: Aluf Or-El (U. of Illinois), Ephraim Kehat and Arie Ram (MIT) and Eliezer Rubin (Columbia) who together with David Hasson and Samuel Sideman provided the core of the new Chemical Engineering Department. From the old staff only Joseph Gileadi was remained in the new department. The new department had in 1964 seven staff members with a modern Chemical Engineering background from seven different universities. The new curriculum was designed also with the help of many visiting professors who came for a semester or a year in the sixties, and who helped in particular to start our graduate courses program. The number of credits was reduced from 200 to 170. Duplicate subjects were dropped. Courses in machine parts, building materials, descriptive geometry, mineral engineering and a mechanical shop were dropped. 40 elective credits enabled partial specialization in polymers, design or advanced chemical engineering subjects. The objective of the department became to educate good chemical engineers with a wide professional base that will enable them, in the future, to update themselves in the advances in the profession, who can be employed in development, design, project engineering and operation of modern chemical plants, and to teach subjects that have not yet been implemented in industry, in order to advance the industry through the new young engineers. Due to the fast changes in the profession at that time, it was decided to review the curriculum every three to five years. It was also decided to implement open book examinations, and to have the design courses taught by design professionals from the industry. Two decisions, that were revoked later, was not to accept our PHD graduates to the staff, in order to discourage inbreeding of ideas, and to require some industrial experience for all new recruits to the staff. The staff grew from the original seven chemical engineers to 15 by the addition of Zeev Tadmor, Ram Lavie, Avi Nir, Avi Marmur, Lenny Pismen, Moshe Narkis, Moshe Sheintuch and Ishi Talmon, and two chemists, Chaim Aharoni and Zwi Rigbi for a total of 18. The number of students grew and peaked at 83 in class of 1974. The ideas presented in the book Transport Phenomena that was published in 1960 revolutionized chemical engineering, by making it possible to develop analytical models of momentum, heat and mass transfer, caused great changes in the curriculum, though we learned fast that unit operations should also be taught in parallel. The use of more accurate, non linear, models to describe chemical engineering problems was limited by approximation required in order to obtain analytical solution, and with the introduction of central computers to the campus we were among the first departments at the Technion to use them in the curriculum. In the late sixties the Technion switched from the common program for all students to a credit system, where students can study at their own pace. This made possible to intake new students twice a year, reduced the number of required credits to 160 or less, of which 10 credits were at the discretion of the students, presumably to take courses in humanities subjects. Many required courses had to be relegated to electives. Most survived, but a few disappeared. In order to prevent a rush to the easiest courses, the choice of electives required at least 3 courses from a list of 6-8 tough advanced chemical engineering or mathematical subjects. Further new Technion rules to prevent under crediting courses and an increase in the number of required basic science courses caused further reductions in the number of required chemistry courses and a few introductory subjects. The main objective of the credit system to switch to more discussion sessions instead of pure frontal lectures failed in most courses, because the students resisted preparing ahead of lecture sessions. Every revision of the curriculum was associated with changes in the elective courses and regrouping them into whatever was fashionable at the time. Two double degree programs, with chemistry and with biology, had very few takers because of the difficulty in coordinating class sessions. A sandwich program, in which students spent 7 months inn industry after the sixth or seventh semester had only two or three takers each year. We tried to prevent attrition of Freshmen to other departments by teaching an introductory course of chemical engineering in the Freshman year. The move to the new building made it possible to have projection equipment in every class, later to be strengthened by computer communication network. It was also possible to build a new chemical engineering lab and two polymer engineering labs, and a process control lab. In 1973 Bill Resnick stepped down after 12 years as chairman, and a rotating chairmanship was started. The chairmen were in most cases elected unanimously. The order of chairs was: Kehat, Sideman, Ram, Rubin, Tadmor, Narkis, Lavie, Kehat (again), Resnick (again), Nir, Hasson, Sheintuch, Talmon. Sam Sideman left the department in order to head the bio-medical engineering department, and Eliezer Rubin passed away, The first generation of the staff began to retire in the nineties: Zwi Rigbi, Bill Resnick, Arie ram, David Hasson, Chaim Aharoni, Ephraim Kehat, Aluf Or-Ell and Ram Lavie. Bill Resnick passed away shortly after retiring. In this period computers became standard tools for students and all students became proficient, early in their studies , in Microsoft Office, Matlab, Hysys and a variety of more specialized programs. A course in biochemistry was added to the required courses, the chemical engineering lab was computerized and an elective membrane lab was established. Expensive research equipment were obtained and made possible to expose graduate students to current techniques. One classroom was computerized and the number of computers in the building grew by more than an order of magnitude. Two internal networks, a Technion network and a wide band to the Internet, moved most literature searches from the library to the local PC. Only one third of our graduates enter the chemical industry. Others go into the semi conductor industry, and the fledgling bio-engineering industry. Elective courses in nano technology, bio-technology, environment engineering were added. A new degree program of bio-engineering in the department is very popular. New staff were recruited in two rounds. In the first round only chemical engineers, Yachin Cohen, Danny Lewin, Gidi Grader, Simon Brandon, Rafi Semiat and Yaron Paz were recruited. In the more recent second round the chemical engineers Havazelet Bianco, and Simha Srabnik, and the physicists Yoed Tsur and Naama Brenner were recruited.